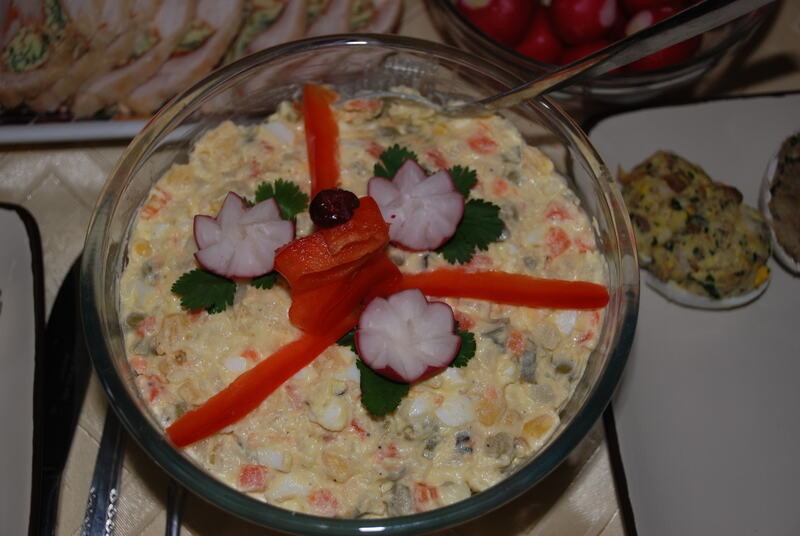 “Sałatka jarzynowa” – for most Polish people this Traditional Polish Cooked Vegetable Salad reminds us of our childhood. It has been a part of Polish tradition since time began, and most of us cannot imagine holidays like Easter, Christmas or a family gathering without it. The weirdest phenomenon about this dish is the fact that you can never repeat the making of it to achieve exactly the same taste. If you take 10 people and give them the same ingredients and quantities to make it, all 10 salads will taste ever so slightly different. A small dice will give a totally different taste to the finished salad than a larger dice will. I tried in vain to find some information as to when and where this recipe came to be but unfortunately it has not been a successful search so far. Wash all vegetables and cook in their skins, in large pot of salted water the potatoes, carrots and the parsnip. Make sure the potatoes are not overcooked, you want them firm. Drain and let them cool completely and then peel them. Dice the vegetables to your chosen size (remember small dice or a bigger dice will give a different taste to the finished salad). Hard boil the eggs. Cool completely and peel and dice. Peel the apple and dice it. Take the canned peas, canned sweet corn and place in sieve for a while, so all the excess liquid is drained off. Now time for the gherkins, these will need to be diced as well, and add them to the sieve for draining. Now take the largest bowl you own and gently mix all the ingredients together, add mayonnaise, salt, sugar and pepper to taste and mix again till well incorporated. Use any spare vegetables you have in the kitchen to make a garnish (see photo above for ideas). Enjoy 😉 and please let me know what you think about it. This sounds just like “Olivier” salad in Russian. Well, I guess it’s technically French? yum. The name is French… I don’t know if the salad is. Might have to look it up!